Lean implementation (or transformation, as it is commonly called) leverages tools for assessing process flow and delay at every step in a process. The focus is on separating value-added from non-value-added activities and eliminating the root causes and cost of non-valued activities. Lean methods are used to quantify and eliminate the cost of complexity. Contact Pinnacle to start your Lean transformation. Six Sigma is a set of qualitative and quantitative (statistical) techniques to systematically improve processes by eliminating defects and process variation. Achieving and maintaining quality improvement requires an organizational commitment that comes from senior management. Lean Six Sigma is a process improvement methodology that combines tools and methods of both Lean and Six Sigma, as the name implies. 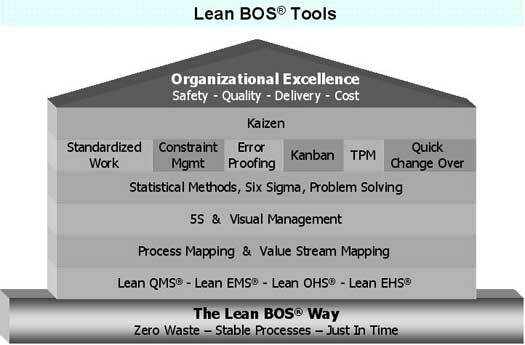 While Lean focuses on speed and flow, Six Sigma focuses on quality (defects and process variation). Lean does not make a process stable or under statistical control. Six Sigma does not improve the flow of information and material through a process. Nor does Six Sigma reduce non-value-added time, movement, effort, inventory, and invested capital. Fusing the two should result is better quality faster and the reduction in cost and complexity. Because Lean Six Sigma is a blend of process improvement methods, it does not provide guidance on integration with an organization's quality management system (QMS) or business operating system (BOS). However, ISO 9001 based QMS standards (e.g. ISO 9001, TS 16494, TL 9000, AS9100, ISO 13485, etc.) are the established benchmark for a QMS or BOS platform and structural framework. Ironically, Lean Six Sigma and ISO 9001 based standards have historically been considered rival initiatives. Lean Six Sigma advocates note that ISO 9001 does not stipulate anything related to speed, flow, and variation, while ISO 9001 supporters point out that Lean Six Sigma fails to address the fundamental need for a standardized business system platform and process management. Both sides are right. Yet these arguments are more often used to advocate choosing one over the other, rather than to support the logical conclusion of integrating Lean Six Sigma and ISO into a Lean BOS® that serves as the true foundation for organizational excellence. 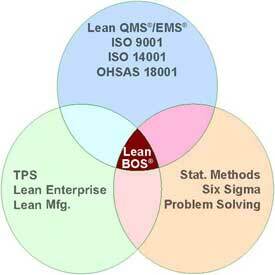 The Lean BOS® is Pinnacle Enterprise Group's (Pinnacle) unique approach to the development of an excellence focused BOS that integrates the tools and methods of Lean and Six Sigma with an ISO 9001 based management system platform. In reality most Lean and Six Sigma projects fail to sustain their gains over time because they are not founded on an ISO 9001 based management system infrastructure that can capture and sustain the improvements. The ISO 9001 based QMS or BOS is typically regarded as a bureaucratic documentation system needed for external audits. Conversely, most ISO 9001 based management systems do not yield any significant process or quality improvement because they fail to incorporate Lean and Six Sigma tools and methods. Lean and Six Sigma are usually considered incompatible and too complicated for the average company. Pinnacle's approach overcomes these misconceptions and other barriers to efficiently, practically, and rationally develop a Lean BOS® that is a true foundation for organizational excellence.